One thing I love about writing for children is the opportunities it gives me to share with other, younger writers. I have met so many kids who LOVE to write, who rejoice in the written word and getting an idea across to readers. One eight-year-old I met recently at a local school is writing a novel via his computer keyboard and he types with two fingers! The look of determination and concentration on his face, as well as his delight in talking to someone else who "gets it" will always remain with me. 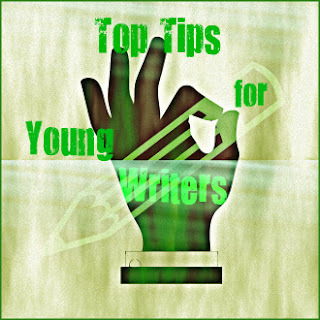 Today I want to share with you some top tips your young writers can use to make their writing stronger. A strong verb is a word we can do (or be, or have) that is specific, one that shows us more layers of meaning than a weak one. Can you see the weak verb in this sentence? She went to school. But if: She skipped to school, we see more about how she went, get a picture of what her body did to get there. Which one of the next sentences paints the clearest picture? He went across the floor. / He crawled across the floor. / He dragged his mangled body across the floor. Try to use a specific noun rather than a general one. Paint us a word picture of your noun so we can "see" it in our imaginations. Marta jumped into the car. / Marta jumped into the shiny red Ferrari. In both examples above, I added extra with "mangled body" and "shiny red". Choosing the clearest and best descriptive words is what every writer aims to do. If we can pull a reader into our writing by appealing to their senses and emotions, it makes our writing doubly effective. Repeating words can slow a paragraph or whole story down. Sometimes we repeat things deliberately, for effect. Thud! Thud! The drums were louder now, and her heart thudded an echo. The reader is caught up in the excitement of these thuds. But if we repeat words unconsciously, it makes our story slower, heavier. That might make a reader give up. Here's an example. "What's in the treasure chest?" asked Pirate Pat. "Is that the treasure chest we've been searching for all these years? It's not much of a treasure chest to look at." Can you think of a different way to write that to avoid repetition? Here's one way: "What's in the treasure chest?" asked Pirate Pat. "Is that the treasure chest one we've been searching for all these years? It's not much of a treasure chest to look at." If you suspect you've repeated words in some text, an easy way to check is to paste the text into a Word Cloud like Wordle or ABCya Word Cloud. The word cloud will show you repeated words in bigger font. Fluff words are filler. Examples are: very, really, quite, a bit, sort of . Again these words slow our writing down. They have less impact than a strong verb, adjective or noun. Instead of "a really big pile of rocks", we could write "an avalanche of rocks" or "a mountain of rocks", depending on the situation. Would you choose avalanche of rocks or mountain of rocks if the rocks were looming above you? Which would you choose if the rocks were starting to fall on you? Sometimes "that" can be removed. Example: Trey thought that he would go. Trey thought he would go means the same, but is quicker to read. One word sounds so small, but in a whole story, removing one word here and another there can make a huge difference. Sometimes "the" can be removed. Example: The candle flames flickered as an icy wind blew. The shadows danced on the wall, creating monstrous, menacing shapes. I shuddered as the clammy hands circled my neck. Can you remove some "the" to make the sentences stronger? Here's one way: Candle flames flickered as an icy wind blew. Shadows danced on the wall, creating monstrous, menacing shapes. I shuddered as clammy hands circled my neck. When you're checking your work (editing or revising), look at each word or phrase you've written. If you can take it out, it's not necessary. Our goal is to make writing strong and clear. Very few writers can do that the first time. That's why they read it over several times and change it. Some even read it backwards to help themselves look at words more carefully. Don't worry though, there's no need to stand on your head! How Do Kids Write a Book Review? Thanks for these valuable writing tips for children - and for adults too! I'll share on FB too. Really valuable tips for writing. Thanks for sharing!